I’m trying to plan my mother’s funeral, but we have a problem. We can’t find her. My mother passed away Saturday after a long illness. I had all the funeral arrangement planned months in advance, so I was prepared when the inevitable happened. After she died, I contacted the proper authorities to transport her body 100 miles to her hometown of Wendell, Idaho for the funeral and burial. Some things don’t always go as planned. Two days later, we know that the body is gone from her assisted living facility but it’s not in Wendell. This is a cause for concern. During the past few years, my mother has been lost in dementia. Even after moving her to a secure nursing home in Boise, there were times when I visited and couldn’t find her. The staff and I would search the facility and find her in someone else’s room and the two residents would be talking about their old times that never happened. No harm was done, and we gently, lovingly participated in their storytelling. But, I always knew she was somewhere inside the building. Today I called the funeral home in Wendell and they hadn’t received the body. How do you lose a casket? I thought I had completed all the necessary arrangements, but I wasn’t familiar with the procedures for this dilemma. I used my inside voice and calmly requested that somebody do something. I called back an hour later and needed to employ my outside, aggressive tone. This last resort has been known to get immediate results and leave people trembling. I’m not proud of this trait, but it works. At last, I received a call from Wendell that they had found her body still in Boise and the transportation was being arranged. A few hours later, I received a call that said she was near Bliss, a tiny village along the route. “Of course she is,” I responded. I hope she had a nice weekend and enjoyed having the last word. But, Mom, now it’s time to go home. Please. Planning a funeral is similar to planning a wedding. Family and friends come together, some cry, music plays, and people wave goodbye. Except, at a funeral, the goodbye lasts a long time. This last momentary interruption is my mother’s way of telling me I’m not always in charge of everything. Somewhere, my parents are laughing. Oh Elaine. Some times I think God wants to help make you a wild success in the world of writing and sends events your way to make sure you have something to write about. I am so glad your mom finally got to Wendell! Elaine. I just love the way you tell a story. And it seems poetic justice was indeed served by your mother. After my mother died she was cremated. My brother, who had already planned a motorcycle trip, flew with mom’s ashes from Oregon to where his bike was stored in California. Then he rode her all through northern Cal before taking her on a plane back to Virginia where she would be buried alongside our father. I loved the photos he sent. You could see the urn perched on the bike, the mighty Pacific in the backdrop…we were all convinced that, had she been asked, she would have jumped at the opportunity to kiss her favorite state goodbye from the back of a motorcycle. May the rest of your arrangements go according to plan. I love this…well, not that you had to go through it, but that you (and we) are still getting the “we’re not in charge” lesson. BTW, my SIL had the same thing happen with her dad. She said that was her first job, to find the body (and it also took two days). Love to you. If you can find humor in this situation, Elaine, you can find it in anything! I’ve got to admire that in a person. Loved this blog. I’m sorry for your loss, but not sorry for your humour! Nicely done (and may all go as planned from here on in!)! It’s amazing how they always manage to get the last laugh, isn’t it? I’m so sorry that this happened to you and that you had to use your “outside” voice at a time when, I’m sure, you would rather be engaging in peaceful reflection. At least they found her, though. And, you know, you got a good story out of it. So, that’s something. Here’s something else: Please accept my condolences on the loss of your mother. Those moms of ours WILL have the last word…and the last laugh. Sorry you had to go through all this, but if you can find the humor in it…that means you’ve made it over the hump. I am sorry for your loss. Glad you have a sense of humor about it because what can you do? She will show up when she does! DId your Mother like to make a grand entrance? She is certainly having the last laugh. Maybe she wanted a final weekend out on the town? I’m very sorry for your loss and hope that the rest of the planning and funeral go without incident. But this will be the story the family remembers and laughs about for years to come, and maybe that is a blessing. Gosh, what else can happen? Here’s to hoping things settle down. Again, sorry for your loss. My Mom and Grandma never got along…and Mom ended up as Gram ‘ s caretaker for the last several years of her life. She was bedridden, but sharp as a tack(though mean as could be) till the end. She would do things to torture Mom, like call the police and tell them she kidnapped her, tell the nurses that Mom had a boyfriend when Dad was out of town…assorted other evil things. 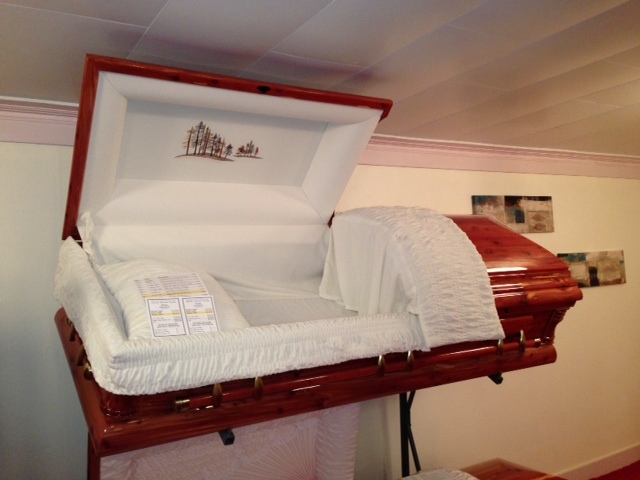 When Grandma died, she was cremated as she desired. However, she was one of those people that were sent to the non – functional crematorium in Georgia some years ago. We still don’t, and never will, know where her remains or ashes are… and whose we were given. Mom says that Gram probably thinks she did it to get even. OMG! Proof that you always have to have a sense of humor, for sure! Your mom’s probably feeling pretty proud that she gave you another great blog post to write! I am so sorry for your loss. Been there. Done that. It is hard. But this post is a wonderful way to recount and cope and lighten the ever-present stress. My major professor lost her step-mother’s ashes for a couple years before she remembered where she might have put them. She did find them. Good thing she was dressed appropriately for a lost weekend in her robe and pearls! Seriously, how the hell do you lose a casket???? To be able to laugh during times of stress shows class and a fabulous sense of humor. Your mother must be smiling down on you from heaven, pleased she could share this last joke with you. Sometimes our mothers have to go to extremes to get our attention.A beautiful post. I enjoyed reading it. Thank you for sharing in such a heartfelt way. The fact that you can laugh about it is amazing. I would have been having a serious meltdown. I take care of my mother who has Alzheimer’s here in SC but we are originally from northern KY and this is where she is to be buried. Hopefully we have a long way to go but I will have to make these same kind of arrangements at some point. I would be very interested to hear about the whole process. I love that you took it so well and I agree your parents are probably still chuckling. It sounds like something my mom would do! OMGoodness I just don’t know what else to say. I hope the rest of the arrangements go as planned. I had to laugh as I read this and your latest post on Facebook. OMG, I thought I was the only one that experienced these things. So glad you are transparent and shared this story with all of us. Too funny. You have got to laugh and realize your Mom did not want you to forget her and sometimes Moms have the last word! This is something my mother would do.